A cross section of the 3D printed laser tube components. It is getting to the point where I’m pretty comfortable in saying that there really isn’t much that 3D printing can’t be used for these days. In the past few years I’ve seen far too many projects incorporate or be made possible by 3D printing that I never would have guessed could have been accomplished that I just don’t like to say it can’t be done anymore. Let’s face it, if you tell a bunch of makers that they can’t do something, one of them is going to figure out a way to do it just to prove you wrong. A maker’s drive to make consists of about 50% curiosity, 25% of showing off and 25% of pure spite directed at the people who say that they can’t do things. Mysterious YouTuber KreAture is a maker and dabbler in electronics who decided to see if he could use 3D printed parts to help build a CO2 laser. While 3D printing a device capable of creating a gas laser sounds pretty implausible, KreAture was more than happy to make it plausible. The CO2 laser is one of the earliest gas lasers to be invented and despite being created way back in 1964, remains one of the most used today. It has a wide range of applications, including welding and laser engraving, military applications, medical applications and it is even used to enrich uranium. While the prototype developed by KreAture would probably not be able to do any of this, the fact that he wa able to create a stable environment to maintain the laser using 3D printed parts is still pretty spectacular. “Laser Tubes are really quite simple if you don’t have complex gas recirculation paths etc. It’s pretty much a tube with a mirror on both ends where one of em lets the beam out. High voltage excites the gas in the tube and the photons traveling out towards the output tend to stimulate other atoms to emit light in the same wavelength and direction. The LASER effect, Light Amplification through Stimulated Emission of Radiation, so glad they didn’t name it LAtSEoR, it wouldn’t have gone down well…” KreAture told me via email. The laser is encased inside of two glass tubes, the outer tube filled with water to cool the inner tube down. The larger tube was made from a carefully cleaned fluorescent light tube and the inner a thin glass tube that KreAture purchased from eBay. But the real tough part of this build was the 3D printed end caps that hold the tubes together. The caps have two sets of channels printed into them, one that feeds water into the outer tube, and a second channel that feeds the gases needed to ignite the laser inside of the inner tube. The gas is fed into the tube via metal tubing inserts that also act as electrodes in the laser tube. The completed laser tube before being hooked up to the air pump. “[The] purpose of the device is pure fun. I mean, it’s LASERs, do we need any excuse or purpose? It was also a matter of proving it could be done. 3D printing has done so much, but laser tubes have been glass-blowers domain. Or hacking with lots of glue and ideally a lathe; or plumbing parts in a pinch,” continued KreAture. The scale of the 3D printed laser tube. The end caps were designed entirely in OpenScad, and KreAture admits that this is just a first pass at his project. The caps are unfortunately not completely airtight because they were initially printed with a pretty light infill, so the laser doesn’t ignite as well as it could. But there is always room to improve and tinker with the parts to help them maintain the needed vacuum longer and allow for more controlled laser emissions. The end caps were 3D printed on a printer of KreAture’s own design that he completed with about $300 in parts. 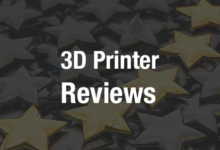 KreAture compares his printer size and print quality to the Rostock Max, although he notes that his version requires less re-calibration and doesn’t share the wear problems occasionally ascribed to the Max. You can keep an eye on KreAture’s YouTube channel for more 3D Printed Laser Tube project updates, including videos about his printer. And let us know what you think about this project over on our 3D Printed Lasers forum thread at 3DPB.com.